The super team of Sylvia and Jim Rennie and Les Turner had two amazing ends on rink 6 with ‘hotshots’ on both ends 9 & 17. On Monday morning the Pintos entertained a very welcome and friendly Toreadors from Monte Mar. We had a splendid morning’s bowls; even the losing rink thoroughly enjoyed the match. The play was closer than the score might indicate, with the Pintos taking 4 rinks and the overall shots. Meanwhile the Palominos were at Country Bowls taking on a strong Flamingos, who proved to be too good on their home mat. But it’s all a learning curve and sometimes you are up against too strong an opponent. Flamingos took all the available points with the palominos fielding a rink short. In the afternoon, the Raiders were at Emerald Isle playing their Saturns and turned in a good effort, in taking 2 rinks losing the overall shots by just one. A good result at Emerald Isle. On Friday morning the Mustangs were playing the Lanzadores at Vistabella and came away without a point, the Lanzadores proving to be too strong on their own mat, winning comfortably. But as much as we all like to win, it was a pleasant way to spend the morning and Lanzadores deserved their win. The Raiders were at home entertaining Montemar Toreadors and put in a good effort all round, taking 2 rinks and losing the overall shots by a small margin. In the Discovery Division, the Sycamores were away to Emerald Isle Neptunes, final score. Shots 90 – 67. Points – 8 – 4. Best winning rink, B Tomlin, V Duchart, skip J Wilcock. 23 – 9. 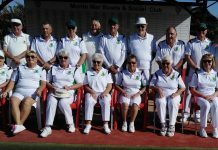 In the same Division the Maples continued their winning ways against a very competent Moonrakers team from Emerald Isle. Final score, shots 83 – 57. Points 10 – 2. Best winning rink, L Hier, J Hier, skip C Dewar. 21 – 10. In the Winter League, we were away to Vistabella. Final score, shots 72 – 76, points,5 – 7. Best winning rink was M Stephens, J Webb, A Eagle, skip D Webb. 13 – 9. In the Fed 4s the Ash at home to Emerald Isle Leprechauns. Final score, shots 54 – 49. Points, 6 – 2. Best winning rink was S Cordell, M Stephens, R Cordell, skip A Eagle. 25 – 12. In the Southern league, the Oaks were away to Emerald Isle Claymores. Final score was shots 88 – 73. Points 9 – 3. Best winning rink, M Stephens, M Dewar, skip M Kelly. 22 – 10. The Cedars were at home to San Luis Pumas, final score shots 105 – 56. Points, 12 – 0. Best winning rink was J Hamill, D Giddings, skip S Hamill. 26 – 8.The Elms were away to Vistabella Conquistadores, final score, shots 70 – 85. Points 2 – 10. Winning rink, J Newell, C Stobbart, skip G Watt. 19 – 11. 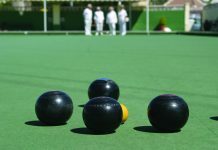 For all inquiries please telephone Chris Dewar on 698 418 987 or visit our website greenlands bowls.com. The final result was shots for Horadada 80. Shots against 87 giving both teams 6 points each. Three matches remaining Falcons, all played at home. The next match is against the team that is below us in the table. Let’s start our great finally by making this one count. The final result being 99 shots for Horadada and 77 against giving us much needed 8 points to 4 against. The Royals have two matches left to play and again both are at home. The next match is against the team who are below us in the table so to ensure safety let’s go for it Royals and get a clean sweep. Very well played to all our team members on both days and keep ‘em bowls a rollin’ Horadada. Monday 04-03-19 the Explorers were at home to Quesada Diamonds. Points for 8 and 4 against. Shots were 96 for and 71 against. The three winning rinks were Anne Stone, Wendy Latham and Peter Parsons, 32-9. Janet Parsons, Jim Manning, and Tom Spencer, 21-9. Roger Stacey, Jean and Don Fowkes, 16-10. Wednesday 06-03-19 found our Winter league playing Benitachell. Points were 8 for and 4 against. Shots were 90 for and 63 against. Best winning rink was Jan and Peter Parsons and Jean and Don Fowkes, 27-5. Friday 08-03-19 The Ospreys were away to E.I Cavaliers. Points for 4 and 8 against. Shots were 90 for and 107 against. This was a close fought contest with only 1 or two points separating 3 of the rinks. No report from Merlin’s. That’s all folks. In the Enterprise Division Apollos shared the spoils with San Luis Treekers with the shots going to Apollos by 97-85 thanks to a 31-5 win on the rink of Pat Harmn, John Taylor and Jean Cooper backed up by Dave Davies with Florence and Mike Edwards winning 17-16. In the Voyager Division Sputniks at San Luis lost by 98-87 with wins from Molly Russell, Tom Heaslewood and Johnnie Rider 32-10 and Joe Kocsis with Noel and Catherine Morrisroe winning 22-14. Phil Hasler with his last bowl managed to ensure an 8-4 victory for San Luis with his final bowl . Pioneers at home to San Luis Romulans had a convincing 96-50 win picking up 11 points. Best wins came from Jo Elkin, Derek Smith and Rab Logan 22-7 and Bill Jordan, Ros Stockell and Vic Mahomet winning 23-9. In the Winter League for La Siesta away at Emerald Isle won on 1 rink and sharing the spoils on a second picking up 3 points losing the overall shots by 96-79.Winners for La Siesta were Barbara Cooper, Val Dalton with Mike and Florence Edwards 24 -20 whilst Brian Harman and Pat Harman with Tony Dalton and Jenny Bowman secured the draw. In the Fed 4’s the Parakeets and Montemar Lords shared the shared the spoils the winning rink for Parakeets came from Dawn and John Taylor with Irene Mangan and Alex Morrice whilst Ros Stockell, Brian Gardiner, George Richardsn and John Ball drew with their opponents. In Division A Blues away at Sanluis Tigers lost by 108 shots to 57 with the Tigers taking all 12 points. 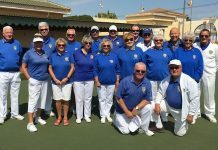 In Division B Golds entertained Mazarron Miners and managed the win on the rink of Fay and Doug Beattie with Ros Stockell winning 22-11. The remaining matches were all close affairs but the Miners truimphed on those rinks winning the overall match by a single shot 80-79. In Division C Silvers at home to Emerald Isle Outlaws won 4 of the5 rinks losing the overall by just 2 shots getting 10 points .Wins came from Dot Kocsis ,Ann Edgerton and Ken Stringfellow, Wendy Ralph, Sheila Millward and Jim Eastwood, Kathleen and Noel Morrisroe with Joe Kocsis and finally Hilary Clarke , Rod Edgerton and Alan Ralph. Not a great start to March for the Toreadors against the Swifts. With four ends to play the Toreadors were losing on one rink, drawing on one rink and winning on three. Thirty minuets later the Toreadors lost on four rinks and won on one, with the Swifts winning the shots. After the long drive to Coulntry Bowls not a very good result for the Matadors, only winning on one rink. Well done to the winning rink of Keith Simpson, Mike Farrelly skip Alan Ashberry. Shots Matadors 69 – 103 Gekos, Points Matadors 2 – 10 Gekos. Away to El Rancho Pintos a difficult game at El Racho, we only managed to win on one rink. Well done to the winning team of Wendy Sheridan, Chris Harding skip Graham Smyth. Not a very good result at home to Quesada Pearls only winning on one rink. Well done to the winning team of Harry Dobson, Steve Hindle skip Dave Melville. At home to La Siesta Parakeets the lords won on one rink, drew on one rink, lost on one rink and only lost by one on shots. Well done to the winning team Jean Chamberlain, David Thomas, Rod Chamberlain skip Chris Merry and the drawing team Sheila Roberts, Paula Cleeter, Howie Williams skip Don Cleeter. On our second visit of the week to El Rancho a much better result for the Toreadors. Winning on three rinks well done to Sheila Roberts, Sue Bounds skip Phil Goble, Jean Chamberlain, Diane Horsington skip Rod Chamberlain, Cliff Norris, Mick soars skip John Hunt. At home to Quesda Swifts the Matadors won on two rinks. Well done to the winning rinks of Tanya Oliver, Danny King skip Jack Burrell, Lynne Armitage, Ronnie Cairns skip Dave Melville. With just a few weeks left to the end of the Winter season the competition has certainly been fierce as all of the teams try to consolidate their position in the league tables. In the Southern League Quesada Swans played Horadada Royals. It was a competitive match with the Swans winning on 2 rinks while the Royals won on 3 rinks and also won the shots 99-77 so the points were 8-4 in favour of the Royals. The Swifts returned to Montemar this week to face the Matadors. It was a nail-biting match with 3 of the rinks decided on the last end. The Swifts managed a win and with the points 8-4 this means the Swifts will hold on to their 2nd place in the league. In the Winter league, Quesada had a bye this week and are now in 5th place in the league just 2 points behind Emerald Isle. In the Federated 4’s Quesada Panthers had an incredibly close and competitive match against San Luis Ospreys. All of the rinks were decided on the last end and the final score was 2 rinks won by the Ospreys (16-14 and 17-15) with one rink drawn 15-15, so the points went to the Ospreys, 7-1. Another up & down week; everyone is still trying hard but sometimes it just doesn’t happen. SA League Monday 4th Klingons home v EI Titans, good result; 10pts-2, 111shots-63. Winners: William Holtham, Sabrina & Russell Marks 20-11, Kath Reid, Pam Lockett, Ian Kenyon 31-11, Colin Jackson, June & Keith Jones 25-11, Giuseppe Galelli, Ann Holland, Ray Pollock 26-11. Trekkers away v LS Apollos, a close result 6pts-6, shots 85-97. Winners: Margaret & Barry Roseveare, Peter Fuller 23-20, Kevin McKenna, Bill Webb, Barry Edwards 19-13, Pat Bird, Judy Carroll, Graham Bird 22-16. Vulcans BYE. Romulans away v LS Pioneers, 1pts-11, 50shots-96. Chris Lythe, Harry Epsom, Mario Cavilla 15-15. Wednesday 6th Winter League: away v Bonalba, a frustrating result 2pts-10, 70shots-78.Jan Pocock, Drew Russell, Sabrina & Russ Marks 25-6. A great result for the Berleen team: Ros Holmes, Barry Edwards, Dave Blackie, Brian Pocock 23-16. FED 4’s League: Thursday 7th Condors home v SM Mohawkes 3pts-5, 44shots-44. Winners: Pat & Graham Bird, Peter Fuller, Drew Russell 20-9. Ospreys: home v Q Panthers, excellent result 7pts-1, 47shots-43. Winners: William Holtham, Janet McEneany, Ann Holland, Peter McEneany 16-14, Neil & Fran Cox, June & Keith Jones 15-15, Ray & Margaret Clarke, David Blackie, Scott Malden 16-14. Southern League: Friday 8th Lions away v SM Bulldogs not a good day at the office, close shots 82-85, 3pts-9. Winners: Colin Jackson, June Jones, Keith Jones 16-16, Kath Reid, Giuseppe Galelli, Ian Kenyon 25-9. Tigers, an excellent result home v LS Blues, 108shots-57, 12pts-0. Winners: Allen Bowen, Marina Beardsall, Les Bedford 24-13, Margaret Roseveare, Judy Carroll, Derrick Cooper 25-10, Irene Everett, Jo & Jules Pering 23-10, Helen Hammond, Peter Fuller, Scott Malden 21-11, Kevin McKenna, Barry Roseveare, Barry Edwards 15-13. Leopards home v SM Boxers, a hard fought match: 4pts-8, 74shots-106. Winners: Pat Tilley, Margaret Clarke, Ken Dullaway 20-16, Dennis Jackson, Cas Blay, Bob Bromley 20-16. Pumas, away v GL Cedars had a very tough game against a very strong team: 0-12, 56shots-105. 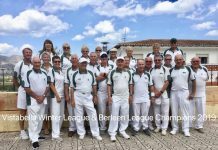 San Miguel Alsatians were home to Vistabella Albatross, losing 4 – 8, (79 shots to 93), the best winning triple were Ken Hope, Jan Farmer and Mike Douglas 21 – 17. 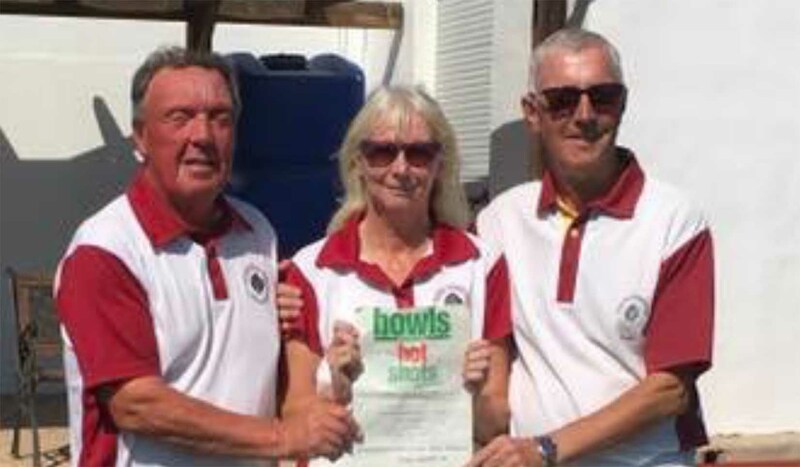 San Miguel Pointers were away to Vistabella Buggies, winning 8 – 4, (88 shots to 84), the best winning triple were Anne Young, Dave You g an d Lee Sinclair 22 – 13. 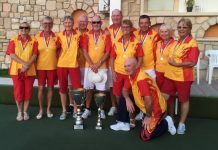 San Miguel Dalmatians were home to Vistabella Eagles winning 10 – 2 (110 shots to 53), the best winning trio were Bob Nesbitt, Barbara Scotthern and Dave Champion 30 – 8. 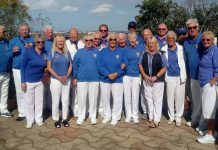 Sand Miguel Beagles were away to Vistabella Drivers winning 9 – 3, (89 shots to 79), the best winning triple were Allan Patterson, Carol Brommfield and Steve Cantley 22 – 12. 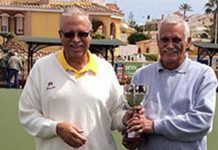 In the Winter League San Miguel were home to el Cid winning 8 – 4 (97 shots to 82), there were two best winning rinks, Brian Miller, Brian Allen, Carol Broomfield and Steve Cantley 24 – 12, and James Cutting, Val Collier, Chris Collier and Stuart Denholm 25 – 13. In the Fed 4’s San Miguel Mohawks were away to San Luis Condors winning 5 – 3, (44 shots to both teams), the best winning rink were Bob Nesbitt, Tony Sansom, Cyril Medley and Dave Champion 19 – 10. San Miguel Cherokees and Apaches both had a Bye this week. Also congratulations to San Miguel Apaches for winning Division B with a game to spare. On Friday San Miguel Bulldogs were home to San Luis Lions winning 9 – 3 (85 shots to 82), the best winning triple were John Marshall, John Staden and Alan Campbell 22 – 12. 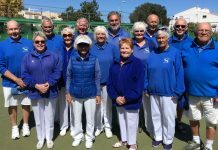 San Miguel Boxers were away to San Luis Leopards winning 8 – 4 (106 shots to 74), the best winning triple are Marilyn Shatwell, Ann Young and Dave Champion 28 – 8. SOUTH ALICANTE LEAGUE. A day with the dogs so to speak! 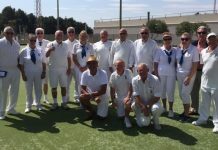 The ENTERPRISE Division Albatrosses were playing the San Miguel Alsatians, they had three wins and two defeats, a good outcome away from home…Shots, VB 93(8) – 79(4) SM. The Drivers at home played the San Miguel Beagles, they only managed one win but had a draw on another rink. Shots, VB 79(3) – 89(9) SM. 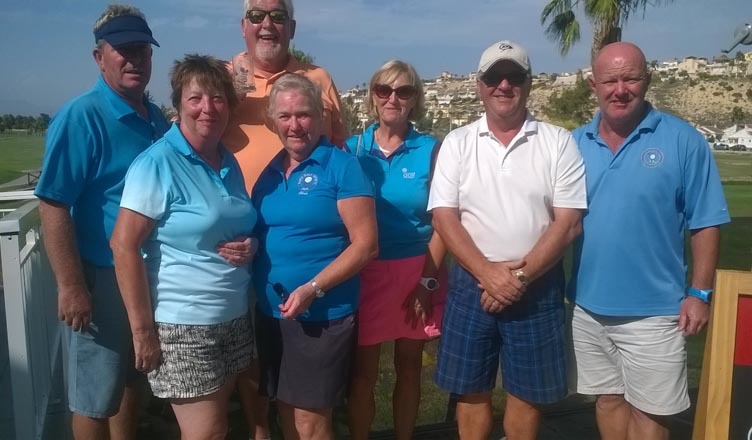 DISCOVERY Division Drivers were also away at San Miguel playing the Dalmatians, they didn’t succeed in knocking the spots off them as they only had one win! Shots, VB 53(2) – 110(10) SM. VOYAGER division Buggies at home to the San Miguel Pointers had the reverse result to their away game earlier in the season, this time the Buggies won on just two rinks. Shots, VB 84(4) – 88(8) SM. WINTER League. At home this week to Greenlands who managed to put our team under a lot of pressure, it was a close fought game with both sides winning on two rinks and a draw on the other but the home team just clinched the overall shots! 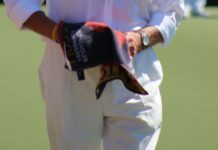 VB 76(7) – 72(5) G.
SOUTHERN League div A. The Lanzadores were at home to the El Rancho Mustangs, winning in style on every rink… a great days bowling in good company, well done everyone! Shots, VB 132(12) – 44(0) ER. The Picadors were also at home playing Quesada Swallows, unfortunately due to illnesses they failed to field a full side, also they were up against a very strong side, they won on just one rink..shots, VB 44(2) – 90(19) Q.
Div C Conquistadors played the Elms away at Greenland. Four wins and one defeat, what a great result..well done to the team. Good luck in your last game next week! Shots, 85(10) – 70(2) G.
The Swingers had a bye.461, or the Secretary Gail Willshire on 965020492. Monday’s game at home against El Rancho Palominos started innocently enough with both teams feeling their way through the first few ends. Suddenly the Palominos imploded or was it that the Flamingos exploded? Hotshot badges and certificates are on their way. Absolutely great bowling, well done to you all. The Cubs headed to El Rancho on Friday in what was the very first experience for many of the Cubs on the fast green. El Rancho were off to a storming start winning on 3 rinks by the half way mark. The Cubs though, were not lying down and brought all but one back in their favour. However, holding onto that lead proved difficult as one rink went down to the last end. Overall score 8 – 4 to the Cubs and the closest of shots being 72 – 71 to the Cubs allowing them to hold onto their 5th league position. Sheena Mallet, Dave Smith & Peter Robins. Joel Fernandez, Agnes Burke & Lynne Bryce. Well done to the Cubs. 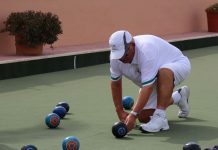 For more information on Country Bowls please visit www.countrybowlsmurcia.com email grahamandjo7@gmail.com or ring 966191552/635086742.